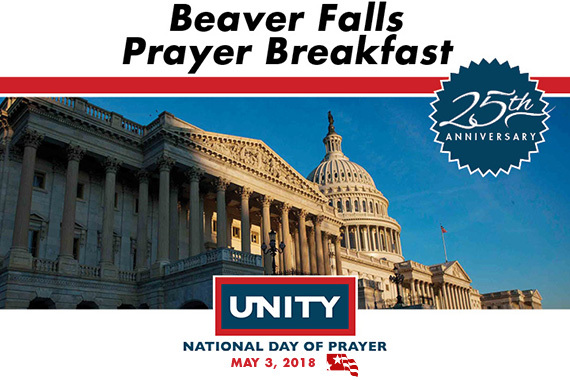 (BEAVER FALLS, Pa.) – Geneva College′s National Day of Prayer Breakfast takes place on Thursday, May 3 from 7:30 to 9 a.m. in Alexander Hall. The theme is Pray for America - UNITY, based upon Ephesians 4:3 which challenges Christians to mobilize unified public prayer for America, "Making every effort to keep the unity of the Spirit through the bond of peace." The National Day of Prayer, held on the first Thursday of every May, has been acknowledged by Congress as an annual event since it was signed into law by President Harry S. Truman in 1952. It strives to emphasize the nation′s love and dependence on God. Geneva′s prayer breakfast is free and open to students, faculty, staff and the public. The free-will offering will benefit local Christ-centered charities. Geneva College is a Christ-centered academic community that provides a comprehensive education to equip students for faithful and fruitful service to God and neighbor. Offering over 40 traditional undergraduate majors and programs, Adult Degree Programs with fully online and classroom options, and high-demand graduate degrees, Geneva's programs are recognized for their high quality. U.S. News & World Report ranks Geneva as a Top Three Best Value Regional University with one of the Top 100 engineering programs in the nation. Adhering to the truth of Scripture, a Geneva education is grounded in God’s Word as well as in a core curriculum designed to prepare students vocationally to think, write and communicate well in today’s world.